HELENA, Mont. - Emotions ran high in the PE Center in Helena, Mont. on Tuesday night when the No. 12 Lewis-Clark State men's basketball team took down the No. 9 Carroll College Fighting Saints for the second time this season to bring home the eighth Frontier Conference Tournament Championship in program history. The Warriors' 27th win of the season, 11th-straight, was one for the books. After one of their best performances all season, LC is bringing some hardware back to Lewiston. "Our guys were excited to play," coach Austin Johnson said. "Our guys respect Carroll and know how good Carroll is. This is why you come to LC State. You come to LC State to play for championships. 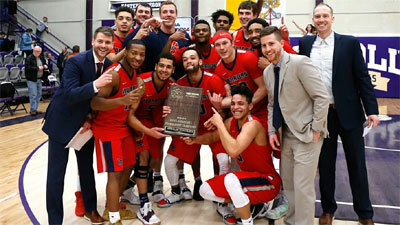 The win snapped a 23-game home winning streak for Carroll, and secured the automatic berth into the National Tournament. Trystan Bradley (6'8''-F) got the Warriors on the board first but Carroll answered with a 3 to take a 3-2 lead. At 16:55 Damek Mitchell (5'9''-PG) put LC back in front with a 3 assisted by Bradley and 30 seconds later a layup from Mitchell grew the advantage to 7-3. A 3 from Dana Abe (6'4''-G) made it eight-straight by the Warriors. They would lead for the rest of the game. At the second media timeout of the first half, LC led 15-9 before Race Martin (6'6''-F) and Josiah Westbrook (6'2''-G) went back-to-back with a layup and 3, respectively, to give the Warriors a 20-9 lead midway through. Derrick White (6'2''-G) hit a 3 at the 6:55 mark to give LC a 27-15 advantage, but the Saints continued to match the Warriors shot-for-shot and keep the contest within 10. Bradley added a triple with 4:15 in the first half before Mitchell hit a pair of foul shots to bring the score to 37-22 with 3:26 on the clock. Just as he did in the first half, Bradley opened the scoring in the second. A reverse layup by White pushed the lead to 50-33 two minutes in. Carroll rallied for a nine-point run to cut their deficit to 50-42 before a three-point play by White snapped the streak at 12:22. Martin made it five in a row for LC with a layup. White and Abe both found success at the free throw line to grow the lead back to 60-47 with under 10 to play. The Warriors brought home the title with a 76-60 victory over the Saints. White led the team with a career-high tying 22 points. Mitchell and Abe each added 14. Abe led the defense with eight boards and Mitchell led with five assists and four steals. LC hit eight 3-pointers in the first half and shot 92 percent from the free throw line (11-12). They held one of the best shooting teams in the NAIA to a field goal percentage of 38, and just 14 percent from 3-point territory. "To hold them to 38 percent shooting and 14 percent from the 3-point line means that our guys defended at a high level. I know there are nights where we are explosive offensively and we have a big scoring margin, but I hope when people look back at this year the appreciate how well we guarded," Johnson said. "I think Cordel Hankerson (6'4''-G), without question, is the best defensive player - a game changing defender - in our league," Johnson added. "Derrick and Damek aren't far behind him, but what Cordel did on Dane Warp (6'4''-G), it changed the game. He only made two shots, but to me he is holding that MVP trophy." In Johnson's first season back to LC he brought home a Championship. "It feels super surreal. I am thankful to work at a place like LC, thankful for the administration at LC State and their support. I am appreciative of the foundation that was laid here when I was an assistant," Johnson said. "We knew we had a capable group, but you still have to go out and do it." "It feels awesome and it definitely feels surreal," Johnson said. "If you would've told me when I stepped on campus at LC State as a 24-year-old assistant coach that I would've been in these shoes I would've laughed at you." The Warriors are heading to Nationals with seven seniors on the squad, including White and David Shedrick (6'3''-G-95) who were on the team when Johnson was an assistant. "Guys like Derrick kind of set the expectation and set the bar for what it means to work, what it means to be a teammate and what it means to be unselfish," Johnson said. The Warriors find out the seeding of the National Tournament on Mar. 13 at 3 p.m. The NAIA will show their Men's Basketball Bracket Reveal on Facebook. G: Dana Abe (6'4''-G) of Lewis-Clark St.
PG: Damek Mitchell (5'9''-PG) of Lewis-Clark St.
Derrick White (6'2''-G) of Lewis-Clark St.